A cot for children with disabilities will have four high cot sides (also known as side/external doors, panels or surrounds). 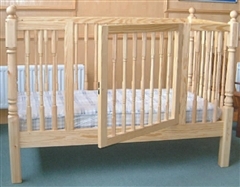 These cot sides are for children at risk of falling, climbing and/or harming themselves in a bed with standard side rails and are not to be used as a means of restraint. These specialised cots are usually the same size as a single bed (to allow children's growth), although there are various mattress sizes available and many may also be made-to-measure. Features available include height adjustment, profiling, Trendelenberg (this feature allows the entire bed to be tilted towards the head) and reverse Trendelenberg (tilted towards the feet) and lateral turning. The doors can be front opening, bi-fold, sliding or drop-down and can include clear perspex panels and full or partial padding. 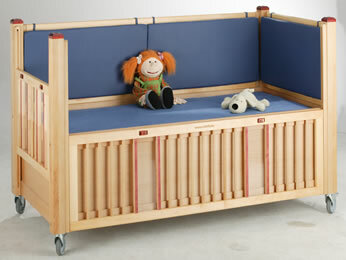 Height adjustable cots are helpful for several reasons. If the height can be lowered, children who can climb in, and children who can transfer sideways from their wheelchair may be able to transfer independently. An adjustable height bed will also reduce the risk of back strain to parents and caregivers - particularly if the bed surface is also used as a changing and dressing table. Read our advice on the use of bed rails (including alternative solutions). 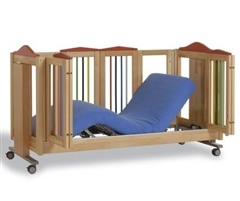 When considering a cot, an individual assessment with an occupational therapist is recommended. Your child's safety in the bedroom is important and there may be individual factors that determine which equipment best suits your child's needs. The information on this site is not a substitute for individual assessment. The equipment listed here may be provided by your local authority, depending on their eligibility criteria. 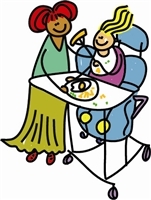 If your child is eligible, the equipment will be provided on a long-term loan basis. Alternatively, you may be eligible for a direct payment from your local authority to purchase something suitable.